Solar Power Australia have over 12 years experience designing, supplying and installing renewable energy systems & lighting solutions for industry and business. We provide relocatable solar lighting, stand-alone solar lighting and magnetic induction lighting solutions for a range of applications. 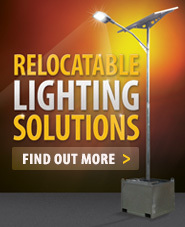 Solar Power Australia’s Relocatable Lighting Solutions allow you to light where you need it, when you need it. The transportable, self contained solar lighting system is perfect for a range of applications and environments. 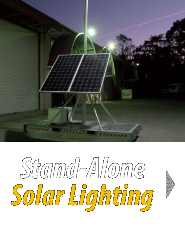 Stand-alone solar lighting is a clean and effective solution for sites where the cost or complication of mains cable installation is prohibitive. Stand-alone solar lighting is a superior option for remote lighting or areas with existing infrastructure which would significantly increase the cost of mains cable installation. Stand-alone solar lighting is the most eco-friendly form of lighting and can be installed with little disruption to the environment in which it is placed. 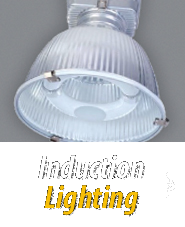 Induction lighting luminaires offer many features which make it an attractive technology for lighting large spaces such as warehouses, factories and carparks. Australian and State Governments are offering great incentives to encourage public and private sectors to implement energy efficient lighting solutions which will minimise greenhouse gas emissions.